The Bosch EX12LED is suitable for all low light installations up to 31m (102ft). The EX12LED is a versatile and economical infrared illuminator that provides covert lighting for short-range indoor and outdoor security and surveillance applications. At a fraction the power of a standard light-bulb, the EX12LED enables standard day/night CCTV systems to deliver high-contrast images in complete darkness. The EX12LED uses Black Diamond illumination technology to deliver unrivaled illumination consistency across the field of view. 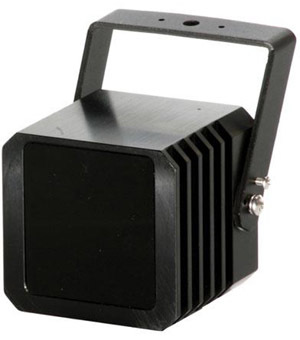 This low-voltage illuminator can be safely and discreetly installed to enhance the night-time performance of both analog and IP CCTV cameras. The EX12LED also enables organizations to save power and reduce light pollution without adversely affecting the performance of the CCTV system. Adjustable infrared intensity , 31m identification range. [Find out more...] Bosch EX12LED Black Diamond "Technical Specifications". [Find out more...] Bosch EX12LED Black Diamond "Technical Data Sheet", 950 kB pdf file.